An LPA is a legal document that allows a person to appoint trusted individuals to make important decisions about finances and care or medical treatment on their behalf, in the event of inability to deal with their affairs, such as through a loss of mental capacity through an accident or illness such as dementia. There are 2 types but what is the difference? A Property and Financial Affairs LPA can be used if a person has capacity but is overwhelmed with dealing with their paperwork or if they have lost mental capacity through longevity, illness or accident – if this LPA is in place, then their appointed individuals will be able to sell a property, access bank accounts, manage investments and ensure all bills are paid. A Health and Welfare LPA can only be used if a person has lost capacity and is a document which gives authority to the person’s nominated attorneys to make decisions in relation to care, medical treatment and life sustaining treatment who would otherwise be unable to make decisions on behalf of the person (or liaise with medical practitioners or social services in relation to care or medical treatment). There is no automatic presumption in place that a spouse or children can deal with those matters informally. You can also appoint professional attorneys such as solicitors to act on your behalf. When do I need these, is there a recommended age? Everyone should have LPAs in place; no one can predict who would suddenly be incapable of managing their affairs if they have suffered from a mental disorder or been in an incident that affects their capacity. 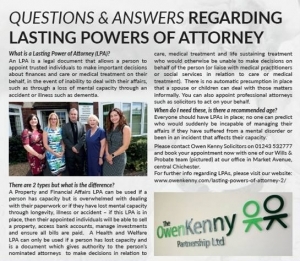 Please contact Owen Kenny Solicitors on 01243 532777 and book your appointment now with one of our Wills & Probate team (pictured) at our office in Market Avenue, central Chichester.